In Toni Morrison’s A Mercy we see life through the eyes of people physically and emotionally abandoned, orphans with names like Lina, Florens, Jacob, Rebekkah and Sorrow. The storm is the clashing of cultures in pre-Revolutionary War America where the laws are not yet defined, everyone and everything is for sale, and all are threatened with annihilation by God, the environment or each other. Europeans looking for a promised land of unending wealth or escape, Natives living through an apocalypse, indentured servants and slaves from Europe and Africa bound to barbaric institutions are all brought to a slow, simmering boil in the torrid fog rolling in over Mary-Land and Virginia…colonies ironically named for women but that are unmerciful and cruel to those females who come to their shores. How can a man scorn trading in “flesh” yet envy the riches of those who profit from slavery? How can a woman forge on in a harsh new world when all her children have died and her husband has become delusional? How can a young slave girl find love when she thinks her mother abandoned her and she has never known freedom? How can a nation arise out of such chaos? These are the types of questions Morrison asks in her new novel. Don’t expect any easy answers. The unsettling underbellies of religion and colonialism are laid bare here among many other things, but so also are some things divine like the glories of hard work, friendship, self-reliance and survival. Armed with her Pulitzer and Nobel Prizes and her tenure at Princeton University, Toni Morrison is a national treasure. You read her books not for entertainment (which isn’t to say they aren’t) but to challenge yourself. A Mercy arrives so acutely woven that you can not only see but taste, smell and touch the frontier world on the eastern seaboard of 17th century America…but perhaps not as clearly as it seems on the surface of the words weaved. Don’t be fooled by the novel’s brevity at 167 pages. When you dig deeper or reread an earlier passage armed with insight from something revealed later on, it’s as if you are in a dream, a brutal and poetic dream that takes everything you thought you knew about the story and guts it like a chicken whose entrails are then used by a haggard old sage to divine the past and the future in the bloody patterns it makes. Your head is empty and your body is wild. And a slave to that, too. Then there are the opening sentences of a chapter exploring the thoughts of two indentured servants, Willard and Scully, who stay at a farm in New Amsterdam even after their master has died and unusual things start happening: Jacob Vaark climbed out of his grave to visit his beautiful house. “As well he should,” said Willard. “I sure would,” answered Scully. (page 143) Here things of a spiritual and matter-of-fact nature need no embellishment with flowery language. A Mercy is less a piece of historical fiction than it is a psychological case study of the personality types that violently came together in the New World. But instead of applying a cold, omniscient voice to the plight, Morrison allows us to intimately glimpse the pain and the sorrow through the impassioned, enraged and bereft voices of those she seeks to study. Whether exploring the quest for identity in Song of Solomon, the aftershocks of slavery in Beloved, the roots of American culture in Jazz or the pre-birth of a nation in A Mercy, when it comes to exorcising the dreams and nightmares of our shared past, nobody does it better than Morrison. In her latest dirge, no mercy comes from the heavens above or the land below, but only from the connections made between the sad souls wishing to leave the latter for the former. Perhaps it was in that little bit of mercy where our nation was born, which would make Morrison’s novel not an elegy but a promise. This entry was posted in Book Reviews, Books, History, Inspiration, Language, Literature, Psychology and tagged 17th Century America, A Mercy, African American Literature, America, Beloved, Colonialism, David A. Price, Fiction, Historical Fiction, Indentured Servants, Jazz, Love and Hate in Jamestown, Maryland, New Amsterdam, New York, Nobel Laureates, Novels, Princeton University, Pulitzer Prize Winning Authors, Slavery, Song of Solomon, Terrence Malick, The New World, Toni Morrison, Virginia, William Faulkner. Wonderful review David. I have read Beloved and like it. I have never read any of Toni’s novels, but this review about A Mercy has definitely piqued my interest. Dave – thanks for pointing me into Toni Morrison’s direction. I haven’t read her but will definitely check out her work. Excellent review. This is one of those books I can imagine repeatedly revisiting, finding something new with each re-reading. The first encounter feels like the start of something fuller, richer, and deeper. I love Morrison. Reading one of her books is to read a true poet in action. 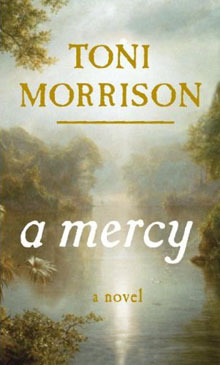 I didn’t find A Mercy to be one of my favorite Morrison novels, but it was well worth the read. I really liked the depth of your review, it’s well done, and your insights have made me reconsider portions of the novel in new ways. Unfortunately, no credit is given to you as the author of this review nor did I see a link back to this site. I write book reviews for the Booklove Blog, and I had one of my reviews plagiarized by this individual, so I’ve been watching carefully to see if they continue to steal reviews. I’m like you and don’t mind a re-post or even partial use so long as the blogger gives credit to the original author or a link back to the original post. However, I’ve noticed some people think that because something is posted on the Internet or in a blog means that it’s free for anyone to use. I’m just glad that Google takes the violations seriously. Wow, Dave, thank you for the link! I’ve posted a link to your site under my Book Reviews links. Just a quick head’s up that the same site ripped another one of my reviews, which I’ve reported. I pop back in on them from time to time. Google is investigating the second theft now, so I’m hoping they’ll remove that one, too. In this “Eden”, this new world of infinite possibility, a group of people—enslaved and free, male and female—have coalesced to carve out a life, to discover a means “to shelter in wilderness”. Their ties—improbable and tenuous—and their disparate histories are explored in the fourth chapter Discuss please. Is their any nature/animal imagery in A mercy.